Distribution center management is a highly mathematical field, but when it comes to breakthrough thinking and creative solutions, true innovators move beyond the numbers. 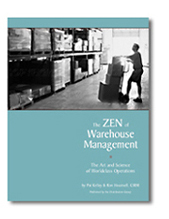 In The Zen of Warehouse Management, authors Pat Kelley and Ron Hounsell provide 20 Zen principles to help management move beyond the numbers to drive creativity and improved performance throughout their operations. One part management guide, one part facility manual and one part inspiration, The Zen of Warehouse Management will change the way you view the problems and opportunities in your distribution centers. The first section describes what the authors call a meltdown DC, where in less than nine months, inventory was doubled, the SKU count increased by 70%, and hourly wage rates were reduced by 22%. In the next six chapters, the authors describe the no-nonsense approach that turned this DC around and made it one of the most productive in its network. This section includes chapters on creating space in the warehouse, maximizing handling productivity, and increasing labor productivity. Next, the authors turn their attention to the age-old problem of congestion and provide strategies for keeping the inbound current; synchronizing orderfilling, determining the best number of routes in an orderfilling wave, making timely replenishments; improving inventory accuracy, using teams to create fluidload, and more. In the final section, the authors describe their success with brainstorming and illustrate how to use this approach to generate the ideas that will create operational efficiencies and cost savings in your facilities. 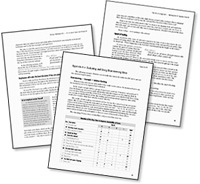 Again, more than just theory, the authors provide complete details for creating an ongoing brainstorming program including how to run the sessions, how to get peoples creative juices flowing, what topics to address, how to track the results, and more. Its an approach that has brought the authors over one million dollars in savings in one distribution network. If youre ready to jump-start your operations with creative new approaches to age-old problems, youre ready for The Zen of Warehouse Management. The Zen of Warehouse Management was written by Pat Kelley, Director of Logistics for True Value Hardware where he has seven DCs reporting directly to him, and dotted line responsibility for another six DCs in the True Value network; and by Ron Hounsell, Director, Logistics Services at Denver-based Cadre Technologies, a leading innovator of fulfillment systems used by logistics service providers, distributors, and manufacturers. Together they have over sixty years of logistics experience serving as second shift corn curl maker, box car potato unloader, straight truck driver, supervisor, manager, superintendent, DC manager, director of distribution, director of logistics services, consultant, network director, vice president and as trouble-shooters for distribution centers in major difficulty. The Zen of Warehouse Management is guaranteed. If you are not 100% satisfied, you may return it within 30 days for a full refund.